Hi everyone! I am Val and I blog over at Val Event Gal. I am so excited to be here sharing one of my fun ideas. 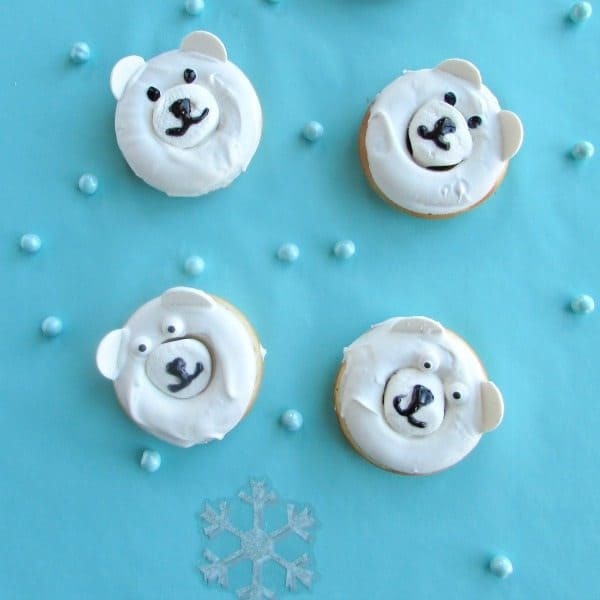 I love anything to do with holidays especially making cute desserts and easy do it yourself projects. I definitely get into the holiday spirit on a buddy the elf level! It is so great to be here spreading more holiday cheer with my adorable Reindeer Donuts! I have been baking up a storm the last couple weeks! I got a new donut pan and I have been obsessed with making donuts! I have always loved donuts but making them is a new hobby. I am figuring out how to make cute donuts, not just the classic donuts with some sprinkles thrown on them. 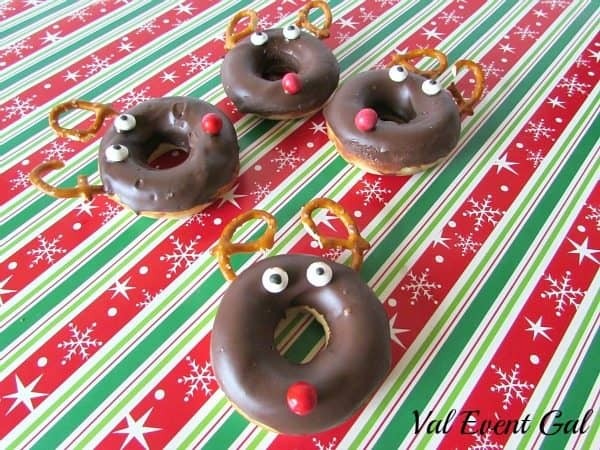 This year Christmas morning is going to include an array of cute donuts including these reindeer donuts! I cannot wait for my daughter to wake up in the morning and see the cute donuts.Okay, she might only be able to see the presents at first because who can blame a kid. When she’s done looking at the presents she will love these donuts. Opening up presents can really make you build up an appetite. We usually pick up food for breakfast Christmas morning. Donuts and pastries are our favorites.” Santa” sometimes is busy wrapping presents the night before Christmas because “Santa” occasionally procrastinates. That is why “Santa” needs an easy Christmas morning breakfast. Store bought plain, chocolate and chocolate glazed donuts work perfectly! You can have store bought and just add a few things to make them into reindeer! 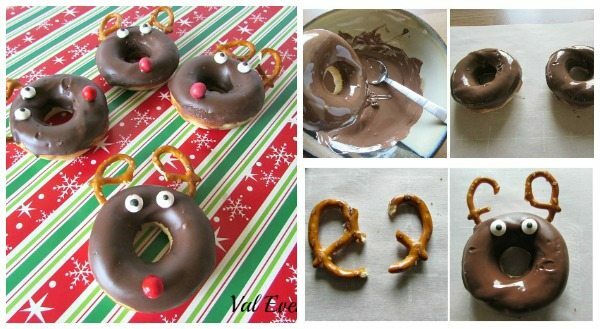 People will think you put more effort in to the reindeer donuts than you did. They are fun for holiday parties and Christmas day. For plain donuts dip one side in chocolate candy melts. The candy melts dry better than regular chocolate. Place donuts on parchment paper or a cookie sheet to decorate and dry. 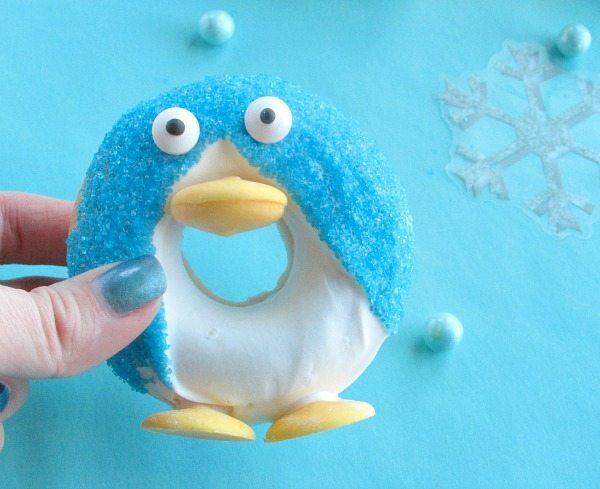 You want to add the candy eyes on before the donuts dry. Add one eye to the top right side and one to the top left side, slightly above the middle. Add the red nose, dip it in chocolate first to make sure it doesn’t fall off. If you aren’t adding the chocolate just dip the back of the candy eyes and nose in melted chocolate before putting them on. This should could them in place. For the pretzel antlers break a pretzel in half. They don’t have to be perfect, none of the pretzels will break evenly. Just try to be somewhat gentle so they don’t break into a bunch of pieces. Wait for the chocolate to dry and do this step last. Of course I didn’t do that because sometimes I’m like a child and can’t wait the 5 minutes for the chocolate to dry. So the chocolate was a bit messy when I was putting them in. Do as I say not as I do! Put one pretzel piece into the top right side slightly to the right of the eye. They should slide in nicely. If for some reason they wont stay you can dip the end you are sticking in in chocolate first before adding it. Let it all dry and you are done. 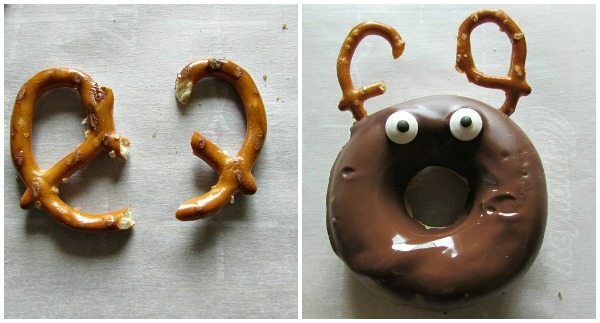 Cute and tasty reindeer donuts! They really are so easy to make and I am excited to make them again! Make them for Christmas morning or take them to a Christmas party! Trackback from 65 Merry Christmas Breakfast Ideas: Holiday Foods - Joy Pea Health | Food. Drink. Nutrition. Wellness.